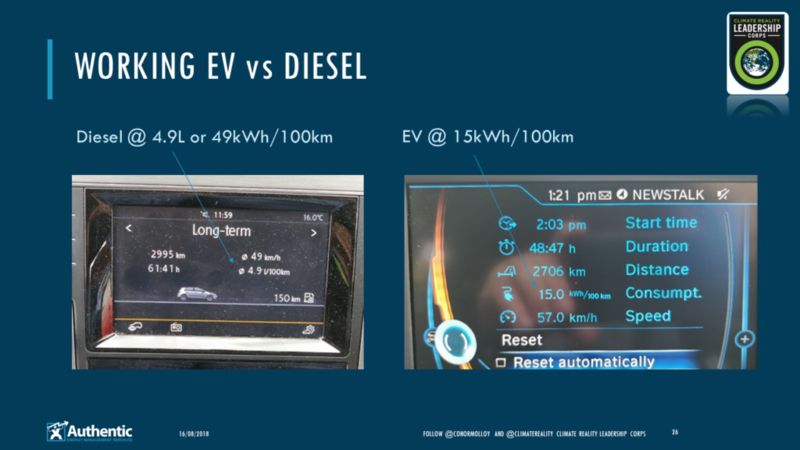 Having diligently monitored fuel use on my diesel car for many years, its fascinating to compare how an electric vehicle performs with the same roads, traffic and driver (me). Aside from performance, both EV and Diesel vehicles that are the subject of this study have roughly the same mass, carry four passengers and have a decent size boot i.e. big enough to carry a full-size road bike (seats folded). A personal requirement is to function as my mobile office, both cars do this; however the electric can run its cooling/heating with the ‘engine’ off, long enough to work for reasonable periods, the diesel can’t (nor can petrol hybrids). So as a working car, how does electric compare to diesel for energy use and emissions ? Here is a snapshot of long-run fuel performance of my driving on both vehicles in Ireland over an approximately 3 week period; a picture tells a thousand words. Measuring fuel use in Litres and electricity in kilo-Watt Hour (kWh or 1,000W for 1 hour). The diesel car (LEFT) consumed 4.9L/100km (57.6mpg) which at 10kWh/Litre is 49kWh/100km at a fuel cost of almost €200. The EV consumed 15kWh/100km, 70% better fuel performance; pretty impressive! Particularly when you see the higher average speed of the EV over this period (diesel at 49kph vs EV at 57kph). What’s even more impressive is that the electricity to charge this EV driving has been entirely free, because I’ve been using public chargers around Ireland. So there’s a double saving (albeit a temporary one). I know other EV drivers are getting even better performance, so there’s still work for me to do. I’ll continue to monitor and post again on running and other costs.